, an eminent artist, was born at Leyden in 1613, and after receiving some instructions from Dolendo, an engraver, and Kouwhoorn, a glasspainter, at the age of fifteen became a disciple of Rembrandt, with whom he continued three years. Rembrandt taught him the principles of colouring, and the chiaroscuro, to which knowledge Douw added a delicacy of pencil, and a patience in working up his colours to the highest degree of neatness, superior to any other master. His pictures are usually of a small size, with figures exquisitely touched, transparent and delicate. Every object is a minute copy of nature, and appears perfectly natural in colour, freshness, and force. In painting portraits he used a concave mirror, and sometimes looked at his original through a frame with many exact squares of fine silk; practices now disused, except by some miniature painters who still use the mirror. Douw’s pictures have always been high-priced in his own country, and in every part of Europe; in finishing them he was curious and patient beyond example. Of this Sandrart gives a singular instance. 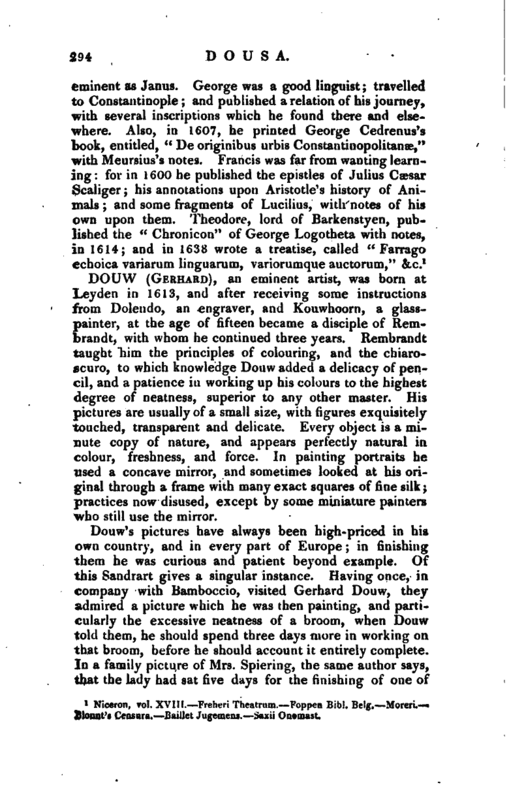 Having once, in company with Bamboccio, visited Gerhard Douw, they admired a picture which he was then painting, and particularly the excessive neatness of a broom, when Douw told them, he should spend three days more in working on that broom, before he should account it entirely complete. In a family picture of Mrs. Spiering, the same author says, that the lady had sat five days for the finishing of one of | her hands that leaned on an arm-chair. For that reason, not many would sit to him for their portraits and he therefore indulged himself mostly in works of fancy, in which he could introduce objects of still life, and employ as much time on them as suited his own inclination. 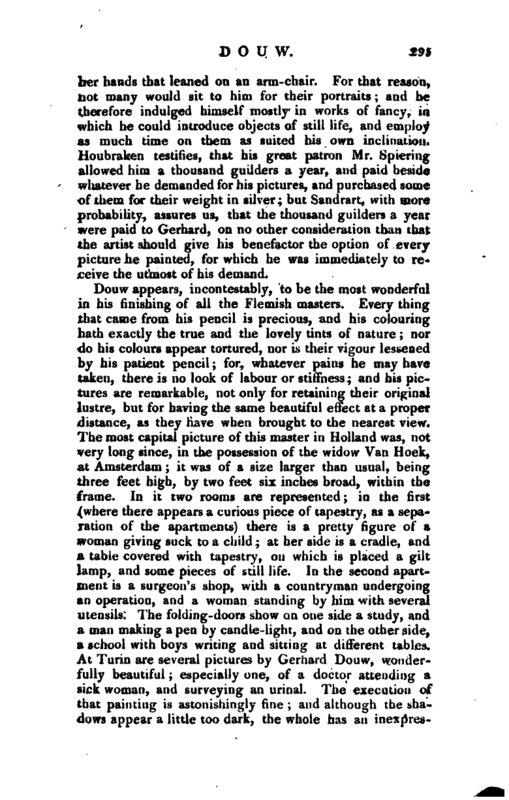 Houbraken testifies, that his great patron Mr. Spiering allowed him a thousand guilders a year, and paid beside whatever he demanded for his pictures, and purchased some of them for their weight in silver; but Sandrart, with more probability, assures us, that the thousand guilders a year were paid to Gerhard, on no other consideration than that the artist should give his benefactor the option of every picture he painted, for which he was immediately to receive the utmost of his demand. Argenville, vol. III. —Descamps, vol. II. 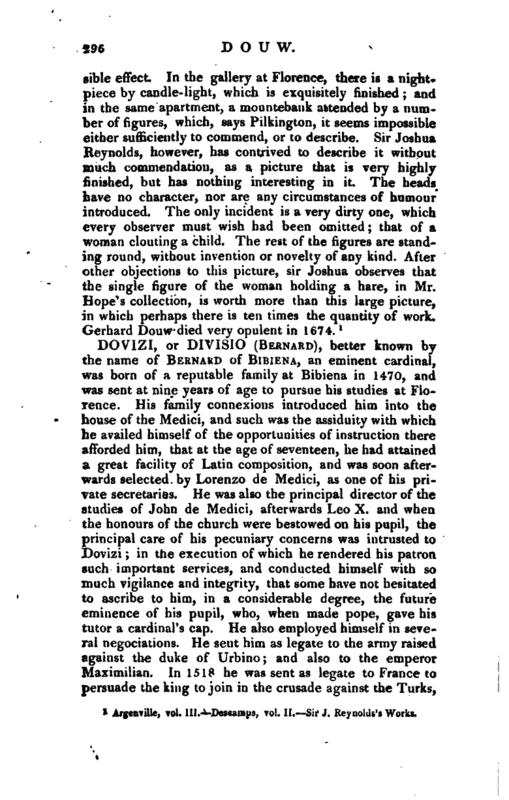 Sir J. Reynolds’s Works.